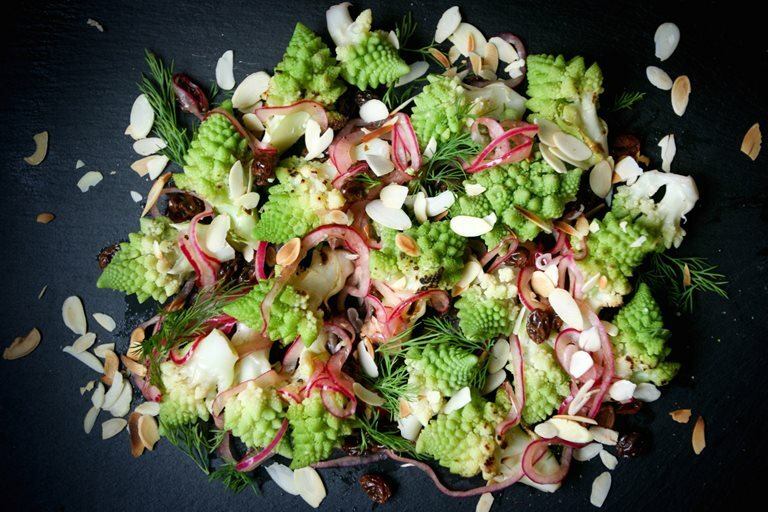 Monica Shaw's colourful recipe for chargrilled romanesco salad can be served as a main too, simply add some chickpeas, cooked quinoa or even fish. I am an ardent lover of cauliflower. 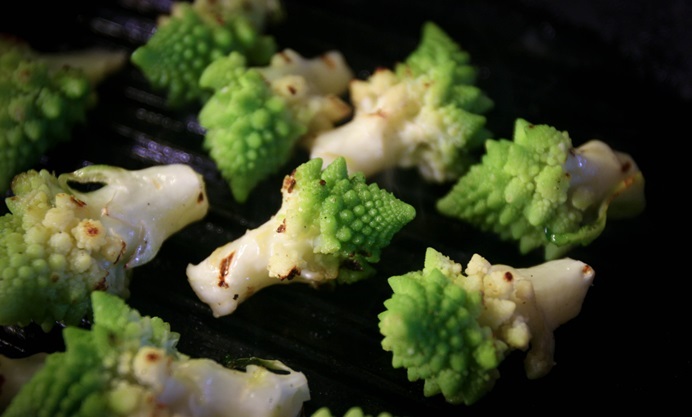 And as a veggie lover who sidelines as a mathematician, a mathematical cauliflower is an extra special thing. 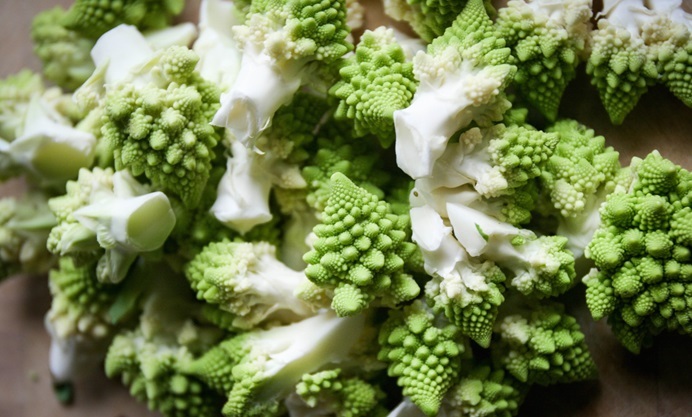 Enter the Romanesque cauliflower (also known as Romanesco or Romanesco broccoli), a beautiful example of a Fibonacci fractal in the natural world, with buds arranged in an enchanting logarithmic spiral. And a special vegetable like this requires special treatment. Romanesque cauliflower has a flavour and texture pretty close to that of regular cauliflower, so I drew on my existing cauliflower know-how for inspiration. Yotam Ottolenghi has a recipe for Chargrilled Cauilflower with Tomatoes, Dill and Capers that I adore. 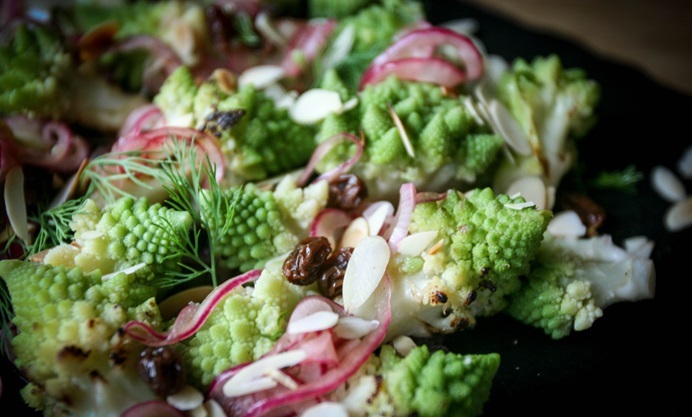 In particular, I love the effect of chargrilling the cauliflower, which has the same crisp, caramel-like appeal of roasted cauliflower, but is fresher and lighter because the cauliflower gets steamed before chargrilling, and is then tossed with a light vinaigrette while still warm. This salad gets the same chargrilling treatment, but instead of tomatoes (far too summery for this time of year), I added raisins, red onion and dill, plus a splash of sherry vinegar and a sprinkle of toasted sliced almonds. It’s a strange combination of ingredients but it works really well. For a complete meal, you could could add some chickpeas, cooked quinoa or even fish (good quality tinned tuna is actually fantastic with this and makes for an easy lunch). I use a little honey in the dressing but you could easily use maple syrup or agave for a vegan salad. This salad ticks the gluten-free, low-fat, low-carb boxes, too.